The City of Palm Bay is located midway between Jackson and Miami on Florida’s Space Coast. With upscale dining, great shopping, access to beautiful beaches, and world-class golf, Palm Bay is becoming a desirable location for adults whose social lives are booming. Waterstone is near the Melbourne Mall, which is home to Macy’s, JCPenney, and many other national stores. For groceries, two Publix Supermarkets are nearby, along with Winn Dixie, The Home Depot, and a Super Wal-Mart. The Majors Golf Course is a challenging 72, 18-hole golf course designed by Arnold Palmer and is just minutes away. The Habitat at Valkaria is also nearby and is considered one of the top five public courses in Florida. If you’re looking for something other than golf, Brevard County has 72 miles of beaches and a number of parks for camping, fishing, boating, swimming, and surfing. If you need medical assistance, you’ll appreciate that Palm Bay Community Hospital and Holmes Regional Medical Center are both within close proximity. Spend a day at the Kennedy Space Center Visitor’s Complex or at Port Canaveral. Take in the Brevard Museum of Art and Science or the Brevard Community College Planetarium and Observatory. And, then, you’re never too old to enjoy a trip to the Brevard Zoo. There’s never a shortage of things to do. 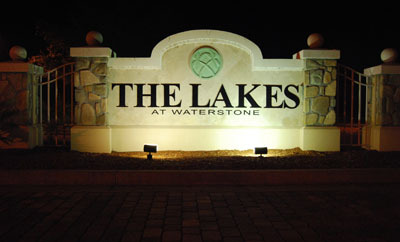 The Lakes at Waterstone are part of the Brevard County school district with Sunrise Elementary, Southwest Middle School, and Bayside High School. The following utilities serve this community: Florida Power and Light for electricity (800-226-3545) and City of Palm Bay Utilities Department for water (321-952-3420).